A religious festival is a time of special importance marked by adherents to that religion. Religious festivals are commonly celebrated on recurring cycles in a calendar year or lunar calendar. Hundreds of very different religious festivals are held around the world each year and a religious festival is about celebrating something that is special to that religion. Festivals (feriae) were an important part of Roman religious life during both the Republican and Imperial eras, and were one of the primary features of the Roman calendar. Feriae ("holidays" in the sense of "holy days") were either public (publicae) or private (privatae). State holidays were celebrated by the Roman people and received public funding. Feriae privatae were holidays celebrated in honor of private individuals or by families. The 1st-century BC scholar Varro defined feriae as "days instituted for the sake of the gods." A deity's festival often marked the anniversary (dies natalis, "birthday") of the founding of the deity's temple, or a rededication after a major renovation. Public business was suspended for the performance of religious rites on the feriae. Cicero says that people who were free should not engage in lawsuits and quarrels, and slaves should get a break from their labors. On calendars of the Republic and early Empire, the religious status of days were marked by letters such as F (for fastus, when it was religiously permissible to conduct legal business), C (for comitialis), a day on which the Roman people could hold assemblies), and N (for nefastus, when political activities and the administration of justice were prohibited). 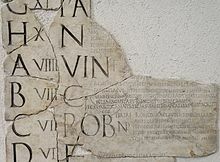 By the late 2nd century AD, extant calendars no longer show these letters, probably as a result of calendar reforms undertaken by Marcus Aurelius that recognized the changed religious environment of the empire. On surviving Roman calendars, festivals that appear in large capital letters (such as the Lupercalia and Parilia) are thought to have been the most ancient holidays, becoming part of the calendar before 509 BC. Some of the oldest festivals are not named for deities. During the Imperial period, several traditional festivals localized at Rome became less important, and the birthdays and anniversaries of the emperor and his family gained prominence as Roman holidays. Games (ludi), such as the Ludi Apollinares, were often dedicated to particular deities, but were not technically feriae, although they might be holidays in the modern sense of days off work (dies festi). After the mid-1st century AD, there were more frequent spectacles and games (circenses) held in the venue called a "circus", in honor of various deities or for imperial anniversaries (dies Augusti). A religious festival held on a single day, such as the Floralia, might be expanded with games over multiple days (Ludi Florae); the festival of Flora is seen as a precursor of May Day festivities. A major source for Roman holidays is Ovid's Fasti, a poem that describes and provides origins for festivals from January to June at the time of Augustus. Because it ends with June, less is known about Roman festivals in the second half of the year, with the exception of the Saturnalia, a religious festival in honor of Saturn on December 17 that expanded with celebrations through December 23. Probably the best-known Roman festival, some of its customs, such as gift-giving and the prevalence of candles, are thought to have influenced popular celebrations of Christmas. Japanese festivals and Barua festivals often involve Buddhist culture, as do pagoda festivals held as fairs held at Buddhist temples in countries such as Thailand. Features of Buddhist Tibetan festivals may include the traditional cham dance, which is also a feature of some Buddhist festivals in India and Bhutan. Many festivals of Nepal are religious festivals involving Buddhism. The central festival of Christianity is Easter, on which Christians celebrate their belief that Jesus Christ rose from the dead on the third day after his crucifixion. Even for Easter, however, there is no agreement among the various Christian traditions regarding the date or manner of the observance, less for Christmas, Pentecost, or various other holidays. Both Protestants and Catholics observe certain festivals commemorating events in the life of Christ. Of these, the two most important are Christmas, which commemorates the Birth of Jesus, and Easter, which marks his resurrection. Among major Islamic religious festivals are Eid ul-Adha, Eid ul-Fitr, Ramadan and Urs. Important festivals include Paryushan, Mahavir Jayanti and Diwali. 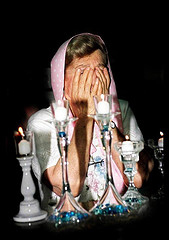 A Jewish holiday (Yom Tov or chag in Hebrew) is a day that is holy to the Jewish people according to Judaism and is usually derived from the Hebrew Bible, specifically the Torah, and in some cases established by the rabbis in later eras. There are a number of festival days, fast days (ta'anit) and days of remembrance. The birthday of Guru Ravidass on Magh Purnima (February 7–12) is celebrated as "Guru Ravidass Jayanti" every year. Major Sikh festivals include Guru Nanak Jayanti, Guru Gobind Jayanti, Maghi, Poonai, Sangrand, and Vaisakhi. ^ Cicero, De legibus 2.29, as cited by Scullard, Festivals and Ceremonies of the Roman Republic, p. 39. ^ Michele Renee Salzman, On Roman Time: The Codex Calendar of 354 and the Rhythms of Urban Life in Late Antiquity (University of California Press, 1990), pp. 17, 178. ^ Wagenvoort, "Initia Cereris," pp. 163–164. ^ Salzman, On Roman Time, pp. 17, 120ff., 178; entry on "Bacchanalia and Saturnalia," in The Classical Tradition, edited by Anthony Grafton, Glenn W. Most, and Salvatore Settis (Harvard University Press, 2010), p. 116. ^ Mary Beard, J.A. North, and S.R.F. Price, Religions of Rome: A Sourcebook (Cambridge University Press, 1998), vol. 2, p. 124; Craig A. Williams, Martial: Epigrams Book Two (Oxford University Press, 2004), p. 259 (on the custom of gift-giving); entry on "Bacchanalia and Saturnalia," in The Classical Tradition, p. 116; C. Bennet Pascal, "October Horse," Harvard Studies in Classical Philology 85 (1981), p. 289. ^ Amulya Mohapatra; Bijaya Mohapatra (1 December 1995). Hinduism: Analytical Study. Mittal Publications. ISBN 978-81-7099-388-9. Retrieved 10 November 2011. Wikimedia Commons has media related to Religious festivals. This page was last edited on 15 January 2019, at 18:11 (UTC).